At some point during the past five years, I realized that I had no choice but to read The Divine Names by St Dionysius the Areopagite. I have been captivated by the Christian doctrine of the creatio ex nihilo and have sought to understand it more deeply, both intellectually and spiritually. This fascination drove me to begin reading St Thomas Aquinas. My forays into the writings of the Angelic Doctor taught me that Thomas loves The Divine Names. He quotes Dionysius over 1700 times. Thomas is famous for his assimilation of Aristotelian metaphysics into Christian theology, yet how many people are aware of the Areopagite’s profound influence upon Thomas’s reflections? How could I understand Thomas’s construal of divinity and creation, I asked myself, apart from the Areopagite? But I heroically resisted. Life is too short. But then I read Pseudo-Dionysius and the Metaphysics of Aquinas by Fran O’Rourke, and the die was cast. So I ordered the affordable Paulist Press edition of the Corpus Areopagaticum and waited for the right time. It appears that time is now. Over the next month or two I will be blogging on the Dionysian themes that most interest me: divinity beyond being; transcendence, immanence, theophany; the apophatic and cataphatic; ecstasis and eros; the relationship between Creator and creation. Two features of this experience figured importantly in resolving my crisis, and thus in my discovering what I believe to be at once the core of the Dionysian message, and the reason for the corpus’ swift reception. These were, first, the as it were “architecture” of the monastic life of personal and corporate prayer and, second, the phenomenon of the ascetic holy man. The latter is the intended goal of the former’s discipline, and has been at the center of Eastern Christian piety and popular devotion since at least the fourth century. On Mount Athos I found that the holy man is not a distant ideal or a literary topos—something out of an eighth century manuscript or a Paleologan icon—but a reality. There are such men alive today, at least on Mount Athos, and I am convinced that I met a few of them. Given this living model, the round of monastic prayer in the public worship of the katholikon and the private liturgy of the cell took on a powerful relevance. Everything about the monks’ life there is directed toward producing the “man of God”, i.e., toward becoming a sanctified temple and resting place of the Spirit of Christ, a “theophany” and thus a “martyr”—witness—to the Resurrection. The very architecture (without the inverted commas) of the monastery bears testimony to this. Everything is focused on that altar which is, literally, at the center of the monastery complex. There the icon of the heavenly liturgy is daily enacted, and the same icon serves simultaneously as the image of the hallowed human being. It mediates between the Kingdom and the soul. Thus Golitzin came to see that the Corpus Areopagaticum is properly interpreted through the lens of the eucharistic faith of the Church rather than through the philosophy of Plotinus and Proclus (or at least not exclusively so). Clearly Dionysius has drunk deeply from the Neoplatonic well; but equally clearly he has appropriated, and at points corrected, Neoplatonic philosophy for service to the gospel. At least that is how I have chosen to read him. You have no doubt observed that at the beginning of this article I refered to the author of the Corpus Areopagaticum as a saint, even though we now know, with a high degree of probability, that he was not the Dionysius converted by the Apostle Paul in Athens. In the scholarly world the author is referred to as “Pseudo-Dionysius.” I adopted this practice when I first started blogging, but one of my readers gently chided me, and I have taken her chide to heart. 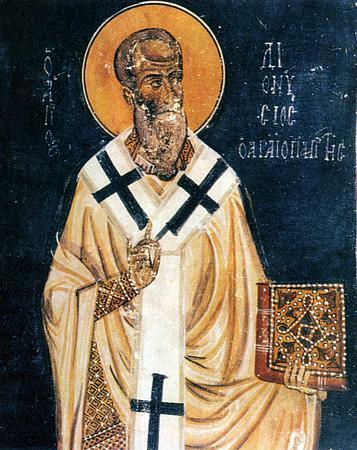 the reading concerned the life of an ancient bishop of Athens who had been a disciple of St Paul; he was a sacred writer, renowned for his treatises on contemplation and the life of monks. The monk explained that a writer of the fifth century had relied greatly upon these writings but lacked the grace to acknowledge his debt. Today the feast of this holy man was being celebrated. The Dionysian writings were received into the Church as brilliantly expressing the mind and tradition of the Apostles, now cast into Neoplatonic idiom. “It was for this reason, far more than for any aura which may have attached to his sub-apostolic pseudonym,” writes Golitzin, “that he was accepted so quickly and so wholeheartedly in the East, and especially so by the monks. Put another way, they welcomed in him what they had known already and accepted in others before him; they recognized him for what he was, a spokesman of the Great Tradition. Put more simply still, the monks have always known better” (Mystagogy, p. 52). The anonymous author has disappeared into the pseudonym. How very apophatic. Hence I will continue to refer to him as “St Dionysius.” Who, after all, likes to be called “Pseudo”? While you are waiting for the subsequent articles in this series to appear, may I suggest that you read St Dionysius’s short essay Mystical Theology. It’s only a few pages long, but you will find it a provocative but helpful entry into the mind of the Areopagite. Blessed Dionysius, pray for us. This entry was posted in Dionysius the Areopagite. Bookmark the permalink. If you’re able to get your hands on Timothy Knepper’s ‘Negating Negation: Against the Apophatic Abandonment of the Dionysian Corpus’ I’d love to hear you take on it. Thanks, Tom, for bringing this title to my attention. Just meant to post the link, not the gigantic picture. Is it just me? but I have pondered for a while how ‘ineffability’ seems so grossly unsuitable for the God we claim has spoken of himself. But maybe the term needs to be taken with a poetic sense, with a heavy dose of creative license, or in some other way? I can’t make any sense of it – unless of course we want to partition God into divisions (we know this, but not that), and I just can’t go there. I’m with you. “Ineffable” seems prima facie ridiculous to apply to a God about whom so many have spoken so well. “Apophatic” is better, denoting as it does an indirect speech. But I think even the supposed binary of cataphatic/apophatic speech is not terribly useful. To understand how language works in relation to the divine, I don’t see how one gets anywhere without studying the nature of allegory, symbol, figuration of any kind. And there I would argue that the relevant distinction is not between cataphatic and apophatic, but between metaphorical and analogical language. That’s just me, though, and I’m irretrievably heterodox about all this. I expect that the next post or two (or the one after) will be raising the question of Dionysius’ understanding of divine ineffability. But I’m curious, Robert. Why do you believe that the the adjective is unsuitable for God? I would think that both St Gregory Nyssen’s understanding of divine infinity (so widely appropriated in the East) and St Thomas Aquinas’s understanding of divine simplicity (so widely appropriated in the West) logically implies ineffability. Real encounters with the ineffable are perceptible in the silence or renunciations of artists — or saints, thinking of Aquinas’ famous description of his writing as “straw.” Rimbaud at some point came up against the ineffable and stopped writing. Sibelius, I think, became silent in the last part of his life and reportedly tried to destroy much of composition. There are many other such instances. These are the real-life encounters with the ineffable that one may speculate about, but it is only speculation because it is the nature of the ineffable that not only can it not be spoken, but usually people cannot even say much of anything about the failure of their most powerful language, have nothing to tell us about their silence. My personal understanding is that silence has to speak for itself, that it is the story or the poem itself that tells us what it means to encounter the ineffable. You look at all that was said and you look at where that stops, and then draw what conclusions you can. I have recommended Max Picard’s World of Silence before. Picard understands Silence as an infinite fullness from which image and language derive. I don’t believe the radically ineffable is compatible with TriUne God. God knows Himself because of a mirroring of the Father in the Son that is infinitely explored by the Spirit. We frequently refer to the analogy of being, but one must keep in mind Przywara’s constant rejoinder that the divine difference is always greater than similarity we discover through creaturely participation. This is not intended to subvert genuine analogical purchase on the Good, but rather, to keep analogy from becoming a kind of fixed structure that could reify into a contented possession of the Good. One must always, as Nyssa understands, respond to the yearning of the soul for a Good that ever exceeds comprehension. Only in this sense, I think, can one accept the ineffable as warranted; if one takes it to keep open an infinite dynamic of exploration. When it becomes a claim of ultimate unknowability, however, it runs cover for a “mystical nihilism” that makes revelation a “penultimate saying” that no longer reveals the Father – or Triune God becomes a religious myth that masks an agnosticism utterly at odds with love, for love is always a gifting that communicates the Person. I second Brian’s recommendation of Picard. He’s really amazing — The Flight from God, World of Silence, Man and Language are all beautiful works of poetic philosophy especially relevant for anyone invested in the beauty of language and interested in extended use of analogical and figurative language, almost like a long poem. I’d also like to take this opportunity to complain that there was not even one single TNG episode based on the philosophy of Max Picard. What a lost opportunity, given the coincidence of names. Because all diastemic language/knowledge of the Adiastemic is analogous – the analogous interval of dissimilarity affects all theology, not merely ‘this’ or ‘that’ of God. Ineffability misleads in confining speech (and silence) to a particular aspect or part of God, dissolving divine transcendence into a creaturely construct. Ineffability fails to recognize different types or modes of speech it falsely affirms univocal knowledge on the hand, and absolute equivocity on the other. But I suspect, and to put this in an Eastern Orthodox context – the divine operations are as ineffable as the divine essence. God’s activity is as mysterious as his existence – who can imagine creating the universe without time, without existing material, without need of anything or anyone, without as much as moving or being moved? In short, ineffability fails to recognize between modes of language. Ineffability is appropriate in theologies in which absolute univocity or equivocity are deemed as (the only) acceptable modes of conveying divine truths. Such theologies cannot do justice to the ‘Existing One’ who is transcendent and cannot be reckoned as a Being among beings. Robert, perhaps we should also say that God transcends both effability and ineffability. That would be a Hartian move, right? Of course God is beyond word, beyond silence, and beyond word and silence. But more precisely ineffability operates by way of a mode of theologizing which does not recognize God as truly transcendent of creaturely existence. One is stuck in thinking about God as (having this part as) known and (that as) unknown, as if God is a creaturely object beholden to extension in time and space. This however is not the God of Scripture (unless of course we read the Mosaic account as univocally literal – the back and front side of God). So I surmise that because of diastema words about God can only by way of analogy, in which the analogous similarity is always ever exceeded by the interval of God’s transcendent being and act. Thank you so much for sharing this thoughtful and faith-full reflection. Your choice of Archbishop Golitzin as a guide to Dionysius seems wise. A holy life as the best road to understanding. A holy life as the truest believing. I wrote a thesis on Dionysius when I was finishing my baccalaureate in Rome. Looking back, I think I used too much of Golitzin and didn’t focus enough on the Neoplatonism present in Dionysius. Looking back, I think I was too influenced by the modern Eastern Orthodox theologians who interpreted him in a palamite way. Eric Perl and DC Schindler’s works on Dionysius helped me to get away from that and see the depth and beauty of his theology, especially using Neoplatonism at the service of theology. In the end though, I still think my thesis back then was true: silence is an experience of the ecstatic love of God in Christ. The Divine Names are hymns to prepare us to come into the Holy of Holies, in front of the Eucharist (negative theology). Look forward to future posts. I have a few posts on Ps. Denys, as I spent much time with him and love him very much. Make sure you read across several translations (AVOID ROREM), and fumble through the Greek, if you can. Worth it. I hope everyone who has read Dionysius will jump right in to correct or elaborate on my postings. Picking up on gregorystackpole’s urging, a lot of people who read him in English translation, probably read him in the Rev. John Parker’s late Victorian ones, various editions of which are conveniently scanned in the Internet Archive. Dr. Leslie S.B. MacCoull’s ” ‘A Woman Named Damaris’: Pseudo-Dionysius’ Celestial Hierarchy in The Place of the Lion”, in The Charles Williams Quarterly, No. 129 (Winter 2008), pp. 10-20, puts the case that Williams was one such. I should note (since the Quarterly archive at the Williams Society site does not extend quite that far – yet? ), that Dr. MacCoull’s paper is probably more readily accessible in Charles Williams and His Contemporaries, ed. Suzanne Bray and Richard Sturch (Newcastle: Cambridge Scholars, 2009) – though I have never managed to catch up with these very interesting-looking conference proceedings, and so have not compared the text to see if it is identical, or if one updates the other. David, may I ask you to scan the MacDoull article and email it to me–at your convenience. TIA.